The audience of the book of First Corinthians was the believers at the church in Corinth, whom Paul had come to know during his time when he stayed there in the house of Aquila and Priscilla (Acts 18:1-3). This lesson will serve as a 1 Corinthians 1 Bible study and commentary. Paul starts his letter to the church in Corinth by addressing the church and more specifically, the believers, of whom he refers to as saints (1). Biblically, a saint is someone who has trusted Christ as their savior and strives to live a Christian life (Acts 11:22-26; Revelation 12:17; Revelation 14:12). Paul states he was an apostle of Jesus Christ through the will of God and makes reference to a person he refers to as Sosthenes, of whom he calls a brother. Sosthenes was the Chief ruler of the synagogue in Corinth who was a believer that was beaten by a mob that sought to persecute Paul (See Acts 18:17). Paul specifically refers to the believers as sanctified in Christ, called to be saints along with others that call upon the name of the Lord Jesus Christ. He concludes by greeting them using the words, “grace to you” and indicates that he is writing to them in the name of the Lord. Paul thanks God on their behalf for the grace He has given them and that they were enriched by God in all that they said and know, thus demonstrating that their testimony of Christ was confirmed to others by their service to the Lord. He mentions that, because of this, they are not lacking in Spiritual gifts while they wait for the return of the Lord Jesus Christ, who will keep them in His hand (John 10:28-29). This passage discusses the fellowship of believers with Jesus Christ through the faithfulness of God. To have fellowship (2) with Christ and other believers means that the members have a common bond. That bond includes salvation through Christ, striving to love one another, common interests, and a unified message and mission. Having this common bond requires that each member of the fellowship thinks the same way. When this happens, they speak of the same things and there are no divisions among them because they have the same mind. Having the same mind results in a unified strength that enables the fellowship to make sound judgments both as individuals and as an organization. Paul mentions that he had received reports of divisions amongst the believers. He lists some of the things he has heard, which indicate the divisions are based on leaders each follows, such as Apollos and Cephas, also known as Peter, as well as some who identify with Christ. These divisions are nothing more than the roots of denominationalism. Even today, some will say I am a Presbyterian, or a Southern Baptist, or Methodist. Realistically speaking these are nothing more than divisions that are rooted in the same causes that Paul is writing about; people following the teachings of someone who has their own take on Christ. Even the word denomination loosely translated means of another name. Paul corrects their thinking by focusing their attention on Christ. Does Christ have a different message for different people? Was Paul, or John Calvin, or Martin Luther, or John Wesley crucified for us? Likewise, was our baptism denominational in recognition? Our answer should be a resounding NO! It was Christ who was crucified for us and our baptism is our public testimony of our identification with the death, burial, and resurrection of Christ, not someone else (Romans 10:9-10). Paul mentions that the people he baptized were so very few that he could list them by name. Considering how many people Paul preached to that were saved, this speaks volumes about the heart of the true gospel. Paul zeros in on the focus of preaching the gospel, which is not baptizing people, but preaching the truth of salvation (1 Corinthians 1:17). The Bible tells us that faith comes by hearing and hearing by the Word of God. This means that there must be people who take the message of salvation to the masses (Romans 10:13-17; Galatians 3:1-14). Without this message, people cannot be saved, which means they cannot receive the Holy Spirit (Ephesians 1:13-14; Ephesians 4:30; 2 Corinthians 1:22; 2 Corinthians 5:5), which means they cannot have the ability to discern truth, which means they do not have the mind and wisdom of Christ (1 Corinthians 2:9-16). Paul makes the point that non-believers who think the wisdom they learned from the world is the truth, think that preaching the gospel is foolishness. Some will even go as far as to put bumper stickers on their cars with quips such as, “Born okay the first time” or an emblem of a fish with legs eating a Christian fish, inferring that evolution devours Christianity. However, God will destroy the wisdom of these people (1 Corinthians 1:19; Isaiah 29:14) and show that their wisdom is useless. Paul points out how God makes fools out of those who claim the wisdom of the world as truth. God uses the simplicity of the gospel to pierce the fallacy of man’s wisdom about eternity. Paul refers to this in 2 Corinthians 11:2 where he says that he is afraid that the believers would be easily deceived about the simplicity of the gospel and adopt a legalistic works based message of salvation. This deception leads people to look to signs and wonders and miracles (Matthew 7:21-23; Mark 13:22) along with advanced studies of man-made philosophies that make the cross of Christ an offense and stumbling block (Romans 14:13; 2 Peter 2 6-8). What the world calls foolish is the source of power and wisdom to those who humble themselves and earnestly seek God’s truth (James 4:6-10). Eternally speaking, this makes the foolishness and weakness of God, according to man’s definition, stronger and wiser than the power and wisdom of man. Here God calls those who are not necessarily wise, mighty, or noble according to the ways of the world. Instead, He takes ordinary people and gives them the wisdom and strength to extraordinary things. As believers who are Biblically literate, it is astounding how some people have no clue even about the simplest teachings of the Bible. This confounds or confuses those who consider themselves to be of high education, intellect, and position because of their pride. This is because pride, along with lust of the flesh and eyes, which is not of the Father, but is of the world (1 John 2:15-16). When this happens, believers are despised and persecuted (1 Corinthians 4:10; James 2:1-6; 2 Timothy 3:12) until such time as God sets things right forever. Finally we come to the heart of 1 Corinthians 1, the source of our wisdom. 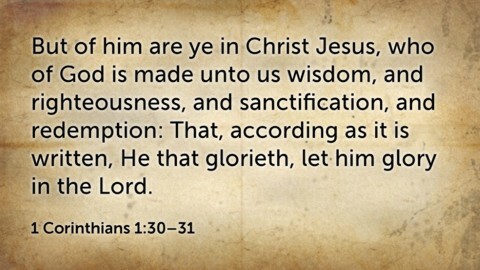 We are told that for those that are in Christ, or believers, the source of wisdom, and righteousness, and sanctification, and redemption is Christ Jesus. This has broad implications in that if Christ is our source of wisdom, then the Bible is our source of wisdom (John 1:1; John 1:14). If the Proverbs were written for us to know wisdom, then the Proverbs were written for us to know Christ (Proverbs 1:2). If fools despise wisdom and instruction, then fools despise Christ and the Bible (Proverbs 1:7). And if the Holy Scriptures can make us wise unto salvation, then only Christ can make us wise unto salvation (2 Timothy 3:14-17). First Corinthians, Chapter 1 starts with Paul’s salutation. It then discusses the foundations for church fellowship and the causes of division. It also touches upon the true gospel of Jesus Christ, which does not involve man-made works such as baptism. From here the pride and foolishness of man is demonstrated to be the cause of false doctrine and teachings, which leads man astray and causes him to despise Christ and His followers. Finally, it shows us that our source of wisdom is Christ Jesus, who is able to make us wise unto salvation and enables us to love others. Resources – Scripture quotations are from The Holy Bible, King James Version. Williams, Michael, (2013). New Testament Survey: 1 Corinthians. Albuquerque, NM: Selah Mountain Bible Institute.